Pam's Cob House: This is the sad part. 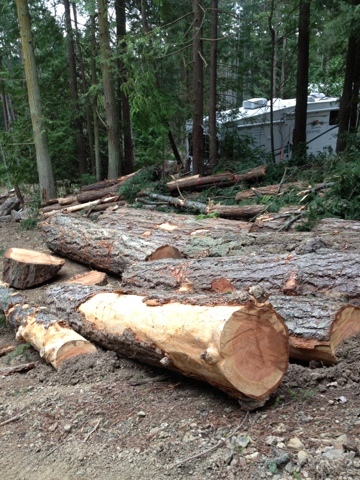 The really sad part about building a house on a fresh lot is that even when you are planning to build a natural home you have to cut down some trees. This was so hard to do as I hate seeing big developers go into forested areas and cut everything down. There are still lots of trees left and we are going to be using the wood from the trees that had to come down to make counters, rafters and floors. My friend has a portable mill and is coming to mill the wood. It is good to see the site taking shape though and I am in the planning stages for getting the septic field put in. My neighbour has suggested I get an engineer to design it and then he can put it in for me. This is a great option and I am going to be making the call this week. The surveyors came and did the corner posts at the front of the lot and are coming back on Monday to do the back posts. It is good to get the survey done properly so we know we are far enough from the property line when we put the foundations in. My apartment in Maple Ridge is up for sale and it is hoped that I sell it soon. I plan on being on Mayne from July for the summer. If all goes according to plan we will be putting the foundation in during July. Reusing the wood and keeping it as a part of the house is the best thing you can do. I can't wait to come out and help you put this together in the summer! It's a good thing you're consulting a professional re: septic field - it is actually one of the few legal requirements that every property owner has, no matter where they live. A percolation test needs to be done, to determine the kind of septic disposal system you can have, given your particular situation. It's both an art and a science, best left to a septic engineer! yes that's for sure, I had the perc test done before I bought the property. So things should go smoothly. Thanks for the comments.